The summer solstice is the first official day of summer, but the weather here in Kentucky doesn’t stand on ceremony. Son, it is already HOT. So instead of savoring that little burn from taking my bourbon neat, I’ve been looking for ways to mix it into a refreshing cocktail. Here’s a great one I found on a blog called Bo’s Bowl. I concur. 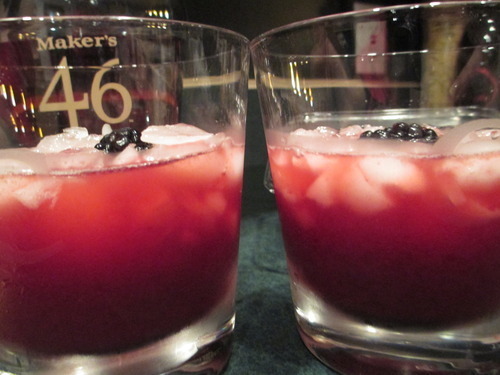 This cocktail is a lovely deep color with a great balance of sweet and tart. 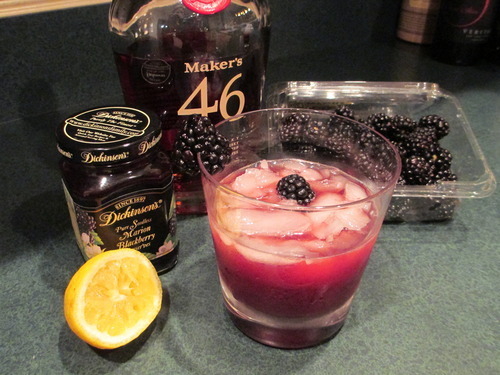 I mixed it with both Maker’s 46 and Maker’s Mark; the latter, as you’d expect, resulted in a slightly sweeter drink. Regardless of which brand you use, take note: This is a potent cocktail, with 3 ounces of bourbon apiece in the two drinks. I plan to scale that back when I make another round to salute the solstice. Hey, it’s the longest day of the year – I have to pace myself.